This year the positive news that amusement park attendance is up is music to many different sets of ears. A true roller coaster junkie will wait all year sometimes to travel to these places, and there is really something to be said for hearing the screams of thrill seekers spiraling over you while you wait in line. We are going to give you a list of some of America’s best locations to take the family or just your significant other. From coast to coast, amusement parks have become more modern and high tech, but the initial thrill and wonderment is still there, like popcorn, arcades and gardens. There is so much to see and do that when a child first gets through the admission gate, you may wish you had a leash on them. Amusement parks are held in regard as the “trip of the year” for many families and especially if you can find a way to avoid the weekends, you may be able to ride until your heart’s content. Here are a few of America’s best parks to wet your appetite for a thrillseeker’s dream. Sitting on Lake Erie and boasting the title of the only amusement park in the world with four roller coasters taller than 200 feet, it is simply world class. This park has also received the Golden Ticket Award from Amusement Today for the last fifteen years straight. If you stay in one of the four six resorts in the area, you can get into the park an hour earlier than the general public, and when you arrive here it deceptively looks just like any resort on the ocean. Soak city is the adjacent water park on site opened in 1988, and requires separate admission. Cedar Point has 16 roller coasters, the second most coaster populated park in the world. The Gate Keeper is the newest ride here, the world’s largest wing coaster that careens from the main gate over the beach. The Gemini is a twin coaster where two different cars race each other, and was the tallest in the world when it opened in 1978. The Magnum XL-200 was the tallest roller coaster in the world when it opened in 1989, and when I rode that thing I was amazed at how scary it was. It no doubt holds some serious clout still in the coaster world. Every other form of ride imaginable is at this park, and it ranks number one on many lists for vacations. The location on the lake is incredible for otherwise landlocked folks who can still enjoy a great beach of blue waters that you view from all the tall rides. 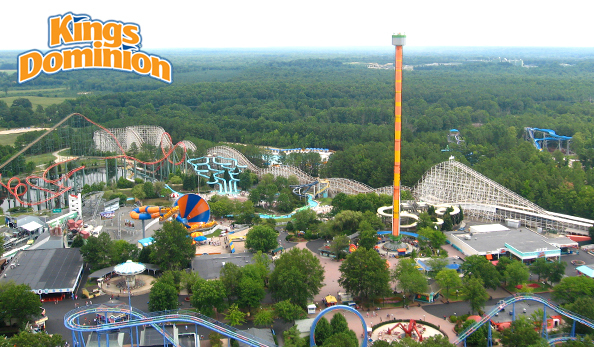 Opened in 1875, this awesome destination spans 400 acres and has 60 rides, with 14 roller coasters. There is a great 1/3 scale rendition of the Eiffel Tower, and around 1998, they started adding some very serious roller coaster action. The Dominator, built in 2008, is the world’s largest floorless coaster, and has the second largest vertical loop on the planet. When you look at this thing, it is a confusing contraption of blue and yellow mesh that looks like a Lego set designed dream, and is one scary devil of a thrill ride. The Grizzly, built in 1982, is simply one of the baddest wooden roller coasters in the world. The White Water Canyon ride is reportedly one of the most awesome rafting rides in the world, and many were modeled after its style. A cult classic film Rollercoaster about a mad bomber was filmed here among other locations, and was a contributing factor to early “coaster mania”. The Avalanche is a bobsled themed ride where park goers feel as if they are in the winter Olympics, and is a crowd favorite. One reason why this amusement park is so big on roller coaster addicts’ list is that there are 17 roller coasters here. It is well known among coaster fanatics that in 1976, they became the first amusement park on the globe to have a 360degree steel looping roller coaster, and shortly afterwards the rollercoaster Colussus was a great wooden racing addition like Cedar Point’s Gemini coaster. In 1982 the Freefall was added, one of the first “free dropping” elevator up, drop down type rides. Riddler’s Revenge, built in 1998, had six loops, and is one mean, green scream inducing ride. The Goliath is another notable ride here that goes up to 85 MPH, and many coaster enthusiasts have travelled from far away to ride it. The parks’ close location to the film industry has had it featured in several major productions, most notably appearing as “Wally World” in the 1983 comedy National Lampoon’s Vacation. Magic Mountain is known as a true giant of amusement parks; the palm tree laden landscape makes it a true gem among summer vacationers.